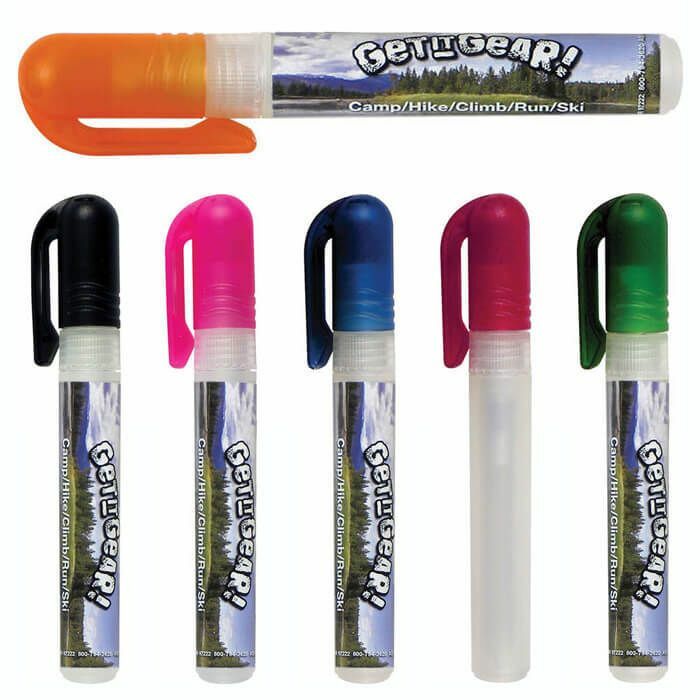 0.2 oz Pocket-sized pen spray sanitizer features a scratch-resistant, waterproof label that can be customized with a four-color process imprint. Choose from Clear, White or Holographic label. Holographic labels are available with single stock color imprint only. Pen spray available in 11 different cap colors. Made in USA. Available for shipment in contiguous US only (shipping to Alaska, Hawaii & Puerto Rico NOT available). Ingredients Active : ethyl alcohol (62%); Inactive : water, hydrogenated starch, carbomer, tetrahydroxypropyl ethylenediamine, fragrance. We absolutely love the way our logo and business name turned out on the pen spray sanitizer!!! Will reorder again!